One problem many of us face and loathe is rust on our tools. Even though I live in Southern California, which is a mostly dry climate, I still end up with rusty tools if left unused. One solution would be to coat all of my tools with something like WD-40, but who has time for that? If I did have time, would I even remember? The No Rust Shield from 3-In-One adresses all of these problems with little work on our part. 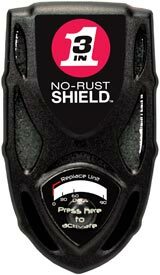 You simply place the No Rust Shield in your toolbox, press the button to activate, and you have rust and corrosion protection for a full 90 days. Plus a built in time strip lets you know when it is time for a new No Rust Shield. Metal-seeking vapor phase corrosion inhibitors (VpCI) from the No-Rust Shield migrate through an enclosed space to form an invisible layer that seals metals against air and moisture that can cause rust and corrosion. The unit protects exposed metal in enclosed spaces without any harmful effects on electrical, mechanical or chemical properties. You can pick up the No Rust Shield at Wal-Mart for around 5 bucks.